I am sure that I am not the only person that has problems sleeping. I’ve long had pain in my hips that causes me to toss and turn and turn and toss. The pain will wake me out of a sound sleep. I also have pain issues with my shoulders. 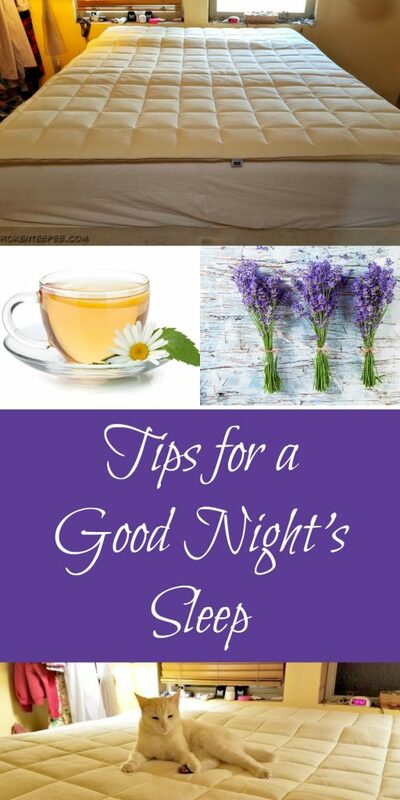 Getting older often leads to troubles with sleep so add that to everything else I have going on and I am on the lookout for tips for a good night’s sleep. This post is brought to you by Airweave but all opinions are my own. 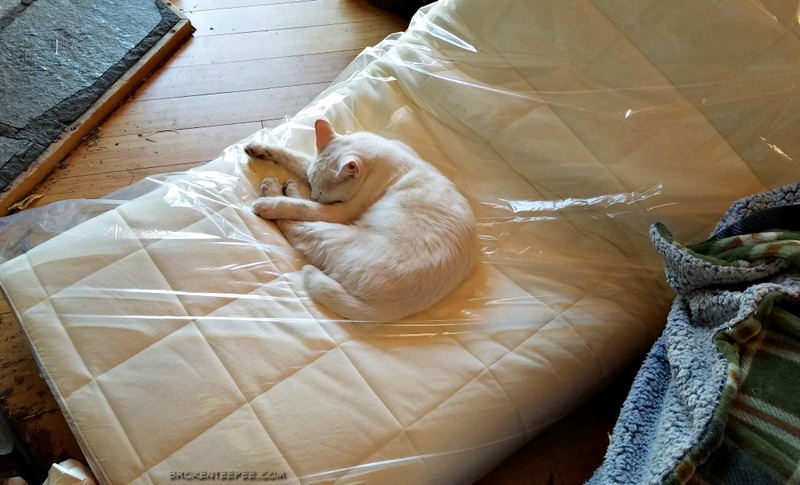 They provided me with a mattress topper at no cost. There are some easy and basic things a person can do to help bring those ZZZZZs. 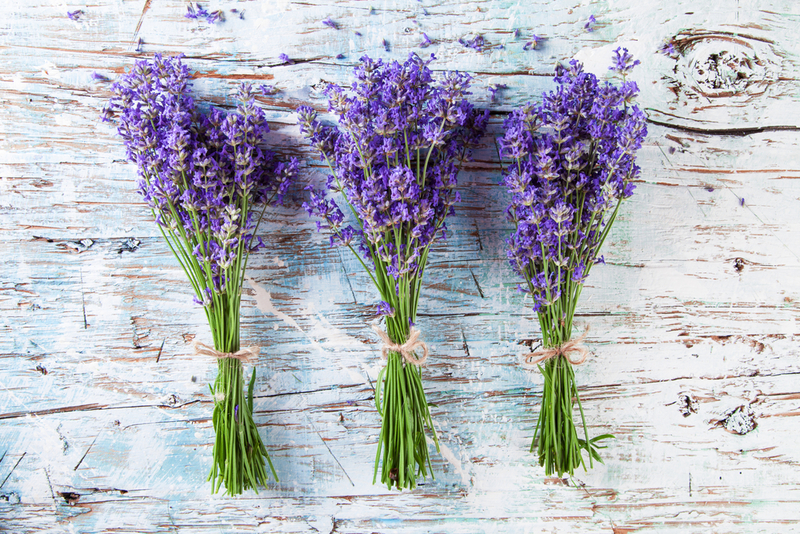 One of the simplest and most fragrant is taking advantage of the relaxing qualities of lavender. It is a member of the mint family which surprised me at first but when I really thought about it, it made sense. You can shower with lavender scented soap or use a lavender body lotion. There are also linen sprays that can make you feel like you are lying in the middle of a lavender field. If you decide to scent with a candle just make sure you blow it out before you go to sleep. This is VERY important. I have a small sachet that I keep in my sweater drawer. Since we have a platform bed the scent is there for me to enjoy. 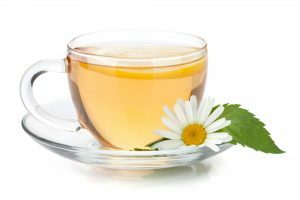 Sometimes there is nothing more relaxing than a cup of chamomile tea. Chamomile is from the daisy family and has been used for years and years as an herbal remedy. It is one of my favorite teas and I will turn to it if I need something calming. The hubby prefers catnip tea – catnip, like the lavender is also a member of the mint family. Others turn to a glass of warm milk. Each of these warm drinks has its advantages for helping to relax you before getting into bed for a good night’s sleep. You would think this would be a given. But believe it or not sometimes a comfortable bed is not as comfortable as it can be. 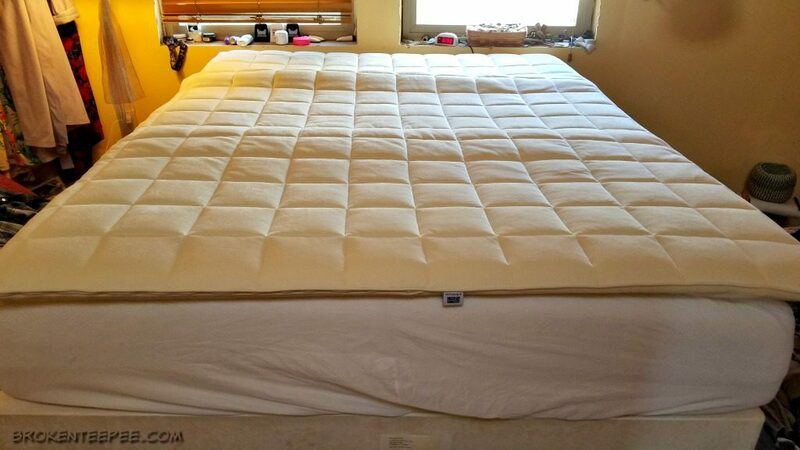 When I first started having all of the pain in my hips my doctor recommended a certain mattress to help. We went out shopping and bought a very expensive mattress. After a month I was still having pain so we exchanged it for another model. It didn’t make much difference but at this point we were stuck. I tried adding a feather bed but I was still having pain. The hubby has an awful time in the summer with the heat. I love it but he does not. That is why I thought this topper would be of benefit to both of us. We were both excited for its arrival but neither one of us would be its first user. That honor went to Snowy as you can see from the photo above. In fact, she thought it was going to be her new bed! In fact Snowy seemed to think it was HER new bed. I had a very had time removing her to make up the bed. So I let her sleep on it a while. In all truth, it did need to air out a bit after I took it from the packaging. It had a bit of a plastic-y smell. It dissipated pretty quickly but I was somewhat loathe to disturb the kitty. But I ultimately did. But she came back. She does look like she owns the place. 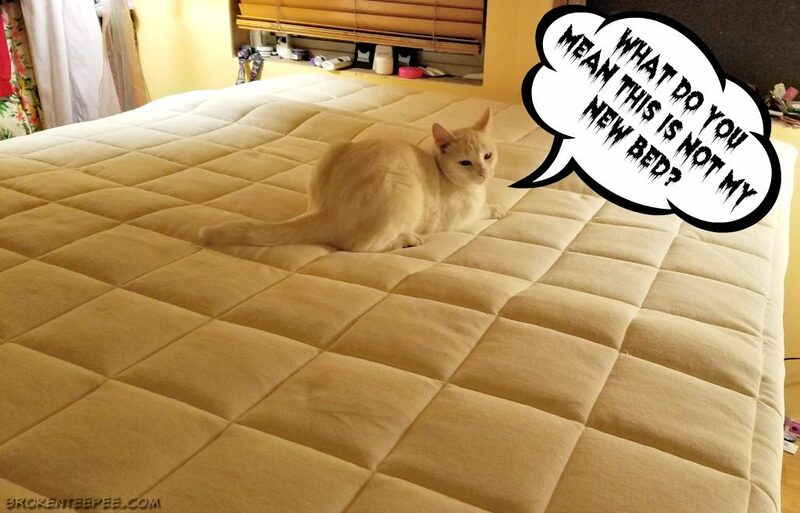 The Airweave mattress topper is incredibly soft. It’s also easy to clean – at least according to the instructions. You just take the cover off to machine wash on delicate and spot clean the insides. That is the important question, isn’t it? I am thrilled to report that in the week I have been sleeping with this topper on our bed I have had little to no pain in my hips. I am amazed. And thrilled. I truly hope it continues. The hubby says that he feels he isn’t sweating as much at night. It’s been warm and we’ve had to keep the windows closed some nights due to the forest fire across the river. It’s making so much smoke we are trying to keep it out of the house. 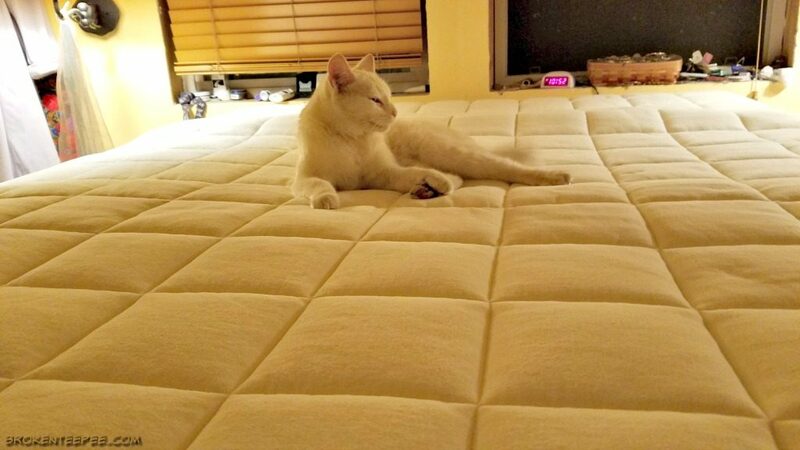 I am very happy with the Airweave Plush Mattress Topper. Now I just need to see if I can find something to figure out the pain in my shoulders and I’ll be in really great shape. But I just can’t tell you how wonderful it is to not have the pain in my hips. It was like an ice pick sticking into them. I recognize that these toppers are an investment but if my experience counts for anything, I am really amazed. And so is Snowy. She has taken to sleeping in the bed with us which she had not done before.